This is the 4th article in a series examining the 2018 farm bill PLC (Price Loss Coverage) yield update option. A 2/20/2019 article found that, of 21 program commodities, only corn, soybeans, upland cotton, and, especially sorghum have a US national PLC yield that is higher with the 2018 than with the 2014 farm bill update formula. This article continues the analysis of these 4 crops by examining the yield update by state. The other farmdoc daily articles in this series (1/17/2019 and 2/7/2019) examine the important impact of crop rotation on PLC update yield. Yield is per planted acre. The US yield ratio (2nd formula term) cannot be less than 0.90 nor more than 1.00. If all other factors are the same, the update formula implies an FSA farm will benefit from the update if its average yield increased more than US average yield from 2008-2012 to 2013-2017. State yield per planted acre is computed for each year from 2008 to 2017 using data from QuickStats (US Department of Agriculture). The formulas in the preceding section are used to calculate 2014 and 2018 update yields. The 2 yields are compared, in essence, assuming the 2014 update yield is the existing PLC yield. Data Note 1 contains added discussion of procedures. Relative to 2014 corn update yield, 2018 update yield ranges from +27% higher for Delaware to -34% lower for Montana (see Figure 1). Overall, 2018 corn update yield is higher for 66% of states accounting for 71% of 2013-2017 production. Of the 10 largest corn producing states, 2018 exceeds 2014 update yield by double digits for Missouri (+19%) and Illinois (+11%). Relative to 2014 soybean update yield, 2018 update yield ranges from +38% higher for Oklahoma to -12% lower for New York (see Figure 2). Overall, 2018 soybean update yield is higher for 74% of states accounting for 79% of 2013-2017 production. Of the 10 largest soybean producing states, South Dakota (+12%) has a 2018 update yield that exceeds 2014 update yield by double digits. For states having both corn and soybean yield data, percent change in corn update yield explains only 3% of percent change in soybean update yield. This low common explanatory power implies corn and soybean update decisions will likely differ for many farms, not only in magnitude but also whether or not PLC yield will be updated. Relative to 2014 sorghum update yield, 2018 update yield ranges from +34% higher for Oklahoma to -5% lower for Georgia and Louisiana (see Figure 3). Overall, 2018 sorghum update yield is higher for 69% of states accounting for 97% of 2013-2017 production. Kansas and Texas, which account for 49% and 28% of production, have 2018 update yields that are +11% and +7%, respectively, higher than their 2014 update yields. Relative to 2014 upland cotton update yield, 2018 update yield ranges from +41% higher for Kansas to -30% lower for South Carolina (see Figure 4). Overall, 2018 upland cotton update yield is higher for 41% of states accounting for 63% of 2013-2017 production. 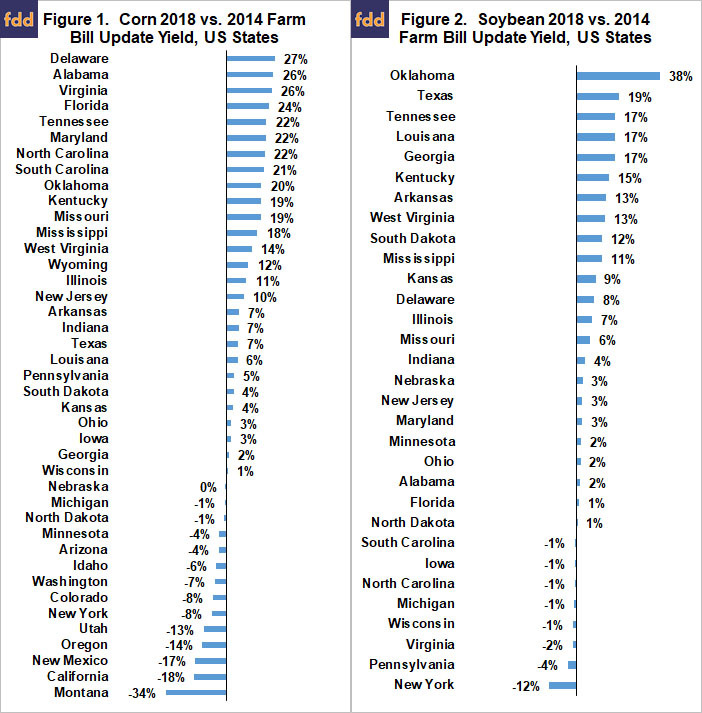 Texas and Georgia, which account for 42% and 15% of production, have 2018 update yields that are +14% higher and -9% lower, respectively, than their 2014 update yields. A consistent theme that emerges from the 4 articles on the 2018 PLC yield update is the large variation across the unit analyzed, whether it be farm, state, or US. This conclusion holds even if negative update yield changes are removed since farms can keep their higher existing PLC yields. The largest changes in update yield occur in small producing states. This finding partly reflects their small production, which is a variation of the small sample size issue found for rotation’s impact on yield update (farmdoc daily January 17, 2019). Large producing states can have sizable increases in update yield. Double digit increases are estimated for Missouri corn (+19%), Texas cotton (+14%), South Dakota soybeans (+12%), Illinois corn (+11%), and Kansas sorghum (+11%). 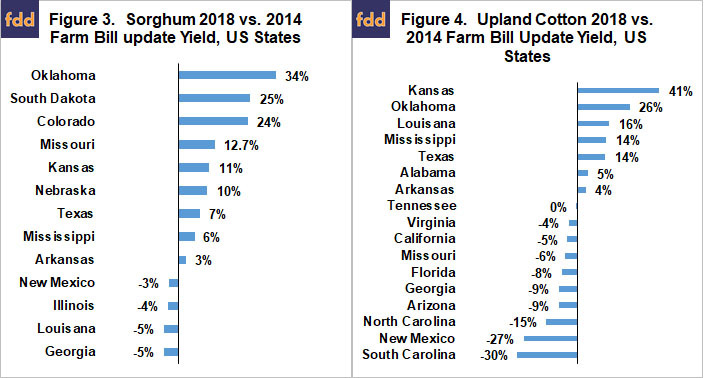 As with the previous analyses, the large variation by state in 2018 vs. 2014 update yield raises the general policy question of whether the 2014 and 2018 yield update formulas meet the fairness criteria for policy, especially in a period when farm program payments may impact the relative prosperity of farms and even determine who survives if financial stress occurs? For soybeans and upland cotton, planted yield equals (production / planted acres). For corn and sorghum, planted acres are reduced by harvested silage acres. Upland cotton yields are used for seed cotton since, as specified in the farm bill, yield for seed cotton is 2.4 times the yield of upland cotton. The constant 2.4 conversion factor means it cancels out in this analysis. Swanson, K., J. Coppess, G. Schnitkey and C. Zulauf. “Impact of Policy Changes on Price Loss Coverage Payments.” farmdoc daily (9):22, Department of Agricultural and Consumer Economics, University of Illinois at Urbana-Champaign, February 7, 2019. Zulauf, C., G. Schnitkey, K. Swanson, J. Coppess and N. Paulson. “Understanding the 2018 Farm Bill PLC Yield Update: Which Program Commodities Have a Higher Update Yield at the US Market Level?” farmdoc daily (9):30, Department of Agricultural and Consumer Economics, University of Illinois at Urbana-Champaign, February 20, 2019.